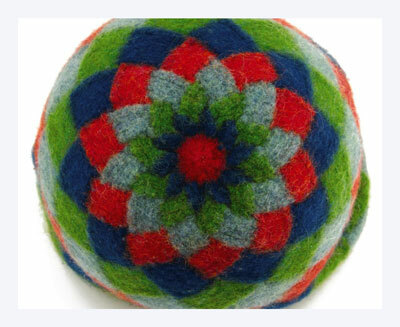 The entrelac blocks in this felted Dahlia tote bag form a beautiful flower design at its base. 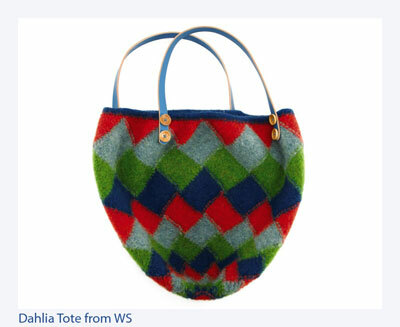 Knit from clear, bright, mill-dyed solids, this bag has a definite snuggle factor as it conforms to the body when worn. 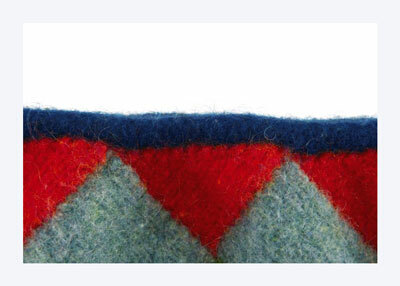 The wool-and-mohair blend yarn felts beautifully, becoming a dense, soft, durable fabric. With MC and DPN, CO 5 sts. Work knitted cord until piece measures 44″ from beg. Place live cord sts on waste yarn. With circular needle and CC1, pick up and knit 120 sts along length of cord, taking care not to twist cord. Row 1 (WS): P2, turn. Cont adding sts in this way until triangle reaches 12 sts on WS (21 rows total); do not turn at end of last row. Begin again with Row 1. Cont until 10 triangles are made. Break yarn and knot ends tog. Join CC2. The gauge for this project is intentionally loose and sloppy. The stitches need room to wiggle and rub against each other in order to felt nicely. Next row (RS): Pick up and knit 12 sts through selvedge edge of first triangle on right needle. Row 2: K11, ssk (last st of block with next st of triangle), turn. Rep rows 1 and 2 until all triangle sts have been used and 24 rows have been worked. Rep until 10 blocks have been worked. Break yarn and tie ends tog. Join CC3. Next row (WS): Pick up and purl 12 sts from edge of adjoining block. Row 1: K2tog, k10, turn — 11 sts. Row 2: P10, p2tog (last st of block with next st of adjoining block from prev tier), turn. Rep rows 2 and 3 until all sts of adjoining block from prev tier have been used and 24 rows have been worked, ending with Row 2. Rep until 10 blocks have been worked. Break yarn and tie ends tog. Join MC. Work next tier with MC, from RS, and with blocks of 10 sts and 22 rows each. Break yarn, tie ends tog, and join CC1. Work next tier with CC1, from WS, and with blocks of 9 sts and 20 rows each. Break yarn, tie ends tog, and join CC2. Work next tier with CC2, from RS, and with blocks of 8 sts and 18 rows each. Break yarn, tie ends tog, and join CC3. Work next tier with CC3, from WS, and with blocks of 7 sts and 16 rows each. Break yarn, tie ends tog, and join MC. Work next tier with MC, from RS, and with blocks of 6 sts and 14 rows each. Break yarn, tie ends tog, and join CC1. Work next tier with CC1, from WS, and with blocks of 5 sts and 12 rows each. Break yarn, tie ends tog, and join CC2. Work next tier with CC2, from RS, and with blocks of 4 sts and 10 rows each. Break yarn, tie ends tog, and join CC3. Work next tier with CC3, from WS, and with blocks of 3 sts and 8 rows each. Break yarn, tie ends tog, and join MC. Work next tier with MC, from RS, and with blocks of 2 sts and 6 rows each. Break yarn, tie ends tog, and join CC1. Work last tier with CC1, from WS, and with blocks of 1 st and 4 rows each. Next rnd (RS): [K2tog] 5 times — 5 sts. Break yarn and thread end through tapestry needle. Run through last 5 sts and pull gently to gather. Fasten securely on WS. Pick out CO sts from cord end and remove waste yarn from opposite end. Graft ends of cord tog. Wash tote in washing machine, using hottest water available, as many times as needed to felt fully. Dry in clothes dryer. 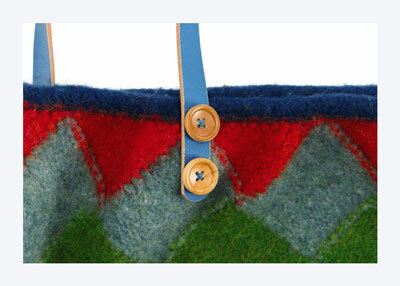 Sew straps to bag, following manufacturer’s instructions.